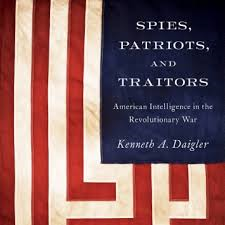 Veteran journalist and author Joseph C. Goulden offers a review of Kenneth A.Daigler's Spies, Patriots, and Traitors: American Intelligence in the Revolutionary War in today's Washington Times. With an academic background in history, and CIA archives on the history of American intelligence at his disposal, Mr. Daigler knew better. He produced pamphlets on intelligence during the American Revolution (available to the public on the CIA home page) to enlighten the visiting officers. Now he has expanded that work into a delight of a read, drawing on his own field experience to present an overview of intelligence during the era. Even those familiar with the broad outlines of his story will find professional insights beyond the knowledge of academic historians. George Washington rightly comes across as the “father of American intelligence.” He wrote a friend, “There is nothing more necessary than good intelligence to frustrate a designing enemy, & nothing that requires greater pains to obtain.” Mr. Daigler sees Washington’s guiding hand in many of the espionage coups of the revolution, notably the Culper Ring in and around New York City.